Apple Caramel Hand Pies/Tarts - Let the Baking Begin! I bought this huge pack of puff pastry and I have been on a marathon of all things puff pastry. It was so huge (9 sheets (24 x 18)) that I split it with my sister. 3 weeks later, I am done with mine and really considering buying back some of my sister’s stock. I love that it’s premade and you can whip something up in a matter of minutes. The variety of things you can make with it are so endless. I made these hand pies, or… individual pies, or …individual tarts, whatever you want to call them yesterday and they just deeper instilled my love for all things baked apples. I added some dulce de leche to the mix you know, just to bring the whole thing over the top, because you can not ruin anything with dulce de leche, in my opinion. Even though apple desserts are very popular in fall, you don’t need to wait until fall to make Apple Pies, especially with the amount of effort it takes to make them. I made mine in 3 inch round tart molds, but you can use a muffin pan to do the same thing. The Pies will be a tad smaller, but not any less delicious. 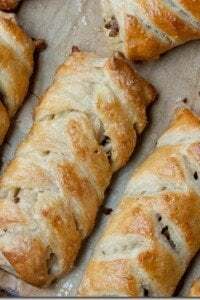 These are my daughter’s hands, so the Apple Pies fit perfectly in the palm of your hands and are very easy to eat, since you don’t need a spoon or a plate and besides, they just look so cute! Quick Apple Cake – Moist apple cake with shredded apples. 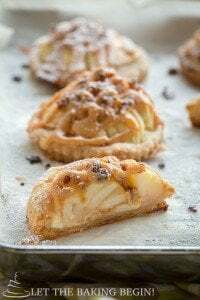 Apple Pastries – Puff pastries with apple and dulce de leche. 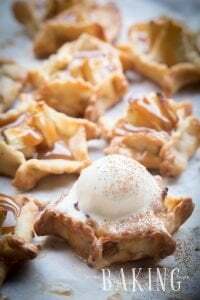 Apple Pie Bites – Mini pes with a warm cinnamon apple center. Place apples, sugar, lemon juice and vanilla extract in a pot over medium heat. Cook with lid off, stirring occasionally for about 15 minutes, or until soft and tender. Add dulce de leche and stir. Allow to cool (place on a flat plate, cover with plastic and put in the freezer for 15 minutes). Cut out circles big enough to fit inside the molds and coming up (higher than the edges) the sides about 1/4 inches (use whatever round objects you might have around the house, that are the right size and go around them with a knife). Place the cutout circles inside the mold and press against the sides. Leave the lined molds in the freezer while you make the lattice for the top of the pies. Turn oven to 375F. Place the rack in the middle. Cut the other pastry sheet into 1/2 inch strips. Make lattice pattern with the strips (see video below). Use a round cutter to cut out circles to match the tops of the tarts, or use another round object (smaller than the first one) and go around with a knife. Fill the tarts with the apple filling. Transfer the lattice circles, using jar lids (slide the lid under the lattice circles), to the tops of the filled tarts. Pinch together the edges of the tart and the edges of the lattice circle. Cut off excess edges, or just crimp them with your fingers. Beat the egg and water together to make egg wash.
Brush the egg wash on the pie tops. Sprinkle with sugar. 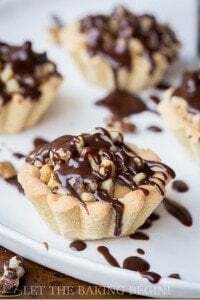 Place the tarts on baking sheet and cover with foil. After 15 minutes, take the foil off and allow the tops to golden up. Remove from the oven. 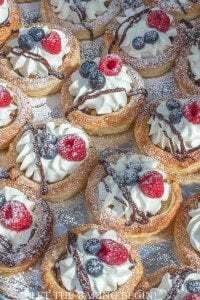 Carefully invert each tart into the palm of your hand (lined with folded paper towel) and place it on a cooling rack or plate. Serve hot with vanilla ice cream or chilled heavy cream. Alternatively allow to cool and serve warm as is. Do you think I can assemble the pie the day before and keep it in the fridge? or freezer? Since the apples are pre-cooked, I think you should be able to freeze the pre-made pies and then just pop them in the oven a little before you want to enjoy them. Absolutely adorable. Apples & puff pastry = heaven! I noticed yoy list lemon juice in the recipe, but not in the directions. I’m assuming it’s added to the apples during cooking? didnt get this part: 5.Cut the other pastry sheet into 1/2 inch strips. Make lattice pattern with the strips (see video below). Use a round cutter to cut out circles to match the tops of the tarts, or use another round object (smaller than the first one) and go around with a knife. we should make lattice pattern on the circle of dough, not right on the apple filling? You make a large “sheet” of lattice, then use cookie cutters to cut out circles of the lattice. Or you can just make individual lattice designs right on the tarts. You absolutely can! I would probably multiply the amount of apples by 1.5 times though. Thank you so much Adi for such a sweet comment! 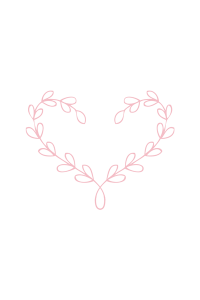 I am not sure if there’s a way to follow me through wordpress but you can definitely subscribe to e-mails as well as add me to your social media sites (instagram, facebook).